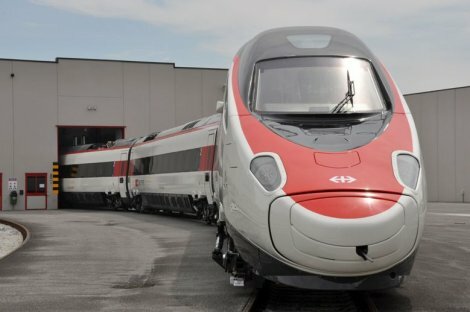 The first of eight new Alstom’s Pendolino ETR610 has left the italian plant in Sevigliano,considered centre of excellence in the production of this kind of train, headed to Switzerland ready for the last dynamic tests that will be executed by the Swiss Federal Railways (SBB) itself. SBB intends to operate these trains on the Gotthard line for the EuroCity trains to Milan from the end of 2014. The ETR 610 supports the voltage and signalling systems used in Switzerland and Germany. This includes the need for much heavier on-board traction power transformers necessary as a result of the lower traction power frequency of 16.7 Hz used in Switzerland and Germany in comparison with those required for the 25 kV 50 Hz AC traction power supplies. The innovative features concern the interior and exterior design, now closer to the customers’ brand strategy and an improved comfort and services for passengers. Some important technical characteristics have been increased, such as the power of the traction unit and the level of redundancy of components and equipment, in order to improve reliability. The new trains will be produced in full accordance with the new regulations governing interoperability (for example, passive security in case of impact). The name, Pendolino, is used to identify a family of high-speed, tilting-technology trains, produced in Italy. These trains owe their name (pendolino can mean ‘small pendulum’ in Italian) to the mechanism enabling them to tilt when going round a bend. The maximum tilt of 8 degrees allows the trains to reach a speed that is up to 35% higher than for conventional trains, whilst assuring the greatest safety and comfort for passengers. Developed by Alstom Ferroviaria, which inherited tilting technology (including that of the British Advanced Passenger Train) after its acquisition of former producer Fiat Ferroviaria. The Pendolino ETR 610 is 95% recyclable and uses an electrical system which injects brake power back into the catenary system. The Pendolino ETR 610 accommodates up to 430 passengers and it can reach the speed of 250 km/h. Is Public Transport really cost-effective? A Siemens study. railwaysignalling.eu seeks signalling copywriters and contributors. Send us your application! Leggo queste notizie e mi inkakkio sempre di piu’. Eccellenze italiane che si perderanno nelle disgrazie della politica. Quanto ci metteranno i politici in carica per scovare un modo per fare soldi con questa capacita’ tutta italiana di fare treni? Spezzetteranno l’azienda e la svenderanno? Chissa cosa si inventeranno per distruggere un gioiello..